On a trip to Israel, Benjy follows in the footsteps of famous Bible people. Enjoy fun Bible stories and activities! 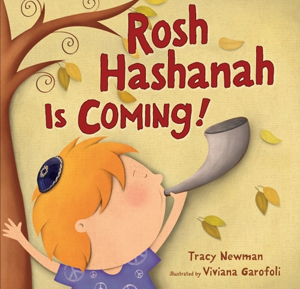 Young children experience the fun of Rosh Hashanah as the shofar welcomes the new year. Ages 1-4 The Purim story with full color pictures, plus pages to color and assemble into a scroll A new solution to an old dilemma--the overcowded seder! What is red? The Rosh Hashanah apple we dip in honey. That is red. Toddlers will enjoy this colorful introduction to the symbols of each of the Jewish holidays. Why is matzah plain & flat? For centuries it's been like that. A rhyming introduction to Passover's traditional food, with children eating & enjoying lotsa matzah many different ways during holiday. On Tu B'Shevat we thank each tree for all it gives to you and me. When Don Fernando, a secret Jews is asked to perform a symphony celebrating the new world, he and his son Rafael devise a daring plan to usher in the Jewish New Year. To go to the E-book website and receive your 10% discount, click HERE. Countdown Hanukkah with The Count and all your friends from Shalom Sesame this holiday season! Grover does a mitzvah (good deed) by joining his friends to spruce up the neighborhood playground. It's Sammy's lucky day when he hitches a ride to preschool in Joshua's backpack! Sammy's curiousity gets him stuck inside the grogger. How will he escape? "What's a Torah?" Sammy finds out during a trip to the synagogue. Sammy Spider has a stow-away adventure in Israel! Sammy Spider watches as Josh's tree shivers in the cold. Then he gets an idea... Shulimson's fantastic debut book is about a grandchild spending a weekend with Bubbie and Zayde celebrates Shabbat during a rare Georgia snowfall when the power goes out. Alef-Bet Yoga for Kids Beginning with the story of Creation, the Bible teaches us to use and respect the land, conserve natural resources, and save energy. Sadie and friends organize breakfast in the Sukkah! At the dreidel-making workshop, Jeremy's friends think hes molding a secret code on his clay dreidel, but hes really making a special gift for his father, who is blind. "One-wish, two-wish, Jew-wish!" Gabriel's magic wand gets him into trouble around the house, until he learns that the greatest magician is a Mitzvah Magician, using his powers to do good deeds. Angry that his father is afraid to kindle the Hanukkah lights, Emanuel stows away on a whaling ship. Tommy's classmates tease him about his Israeli accent and the way he speaks English. But his knowledge of Hebrew makes him a hero when a policeman and his dog come to visit Tommy's school. Little boy & his family gather at cemetery for unveiling of his beloved grandpas gravestone, bringing stones to place on grave, as is Jewish tradition. Anna is excited to be the flower girl at her aunts wedding, but that morning she wakes up and ... achoo! Rifkas parents are actors in the Yiddish Theater, and one day she finds herself center stage in a special role! When Sadie runs to show her mother the Hanukkah menorah she made in school, she trips, the menorah shatters, and she is devastated. Heller chronicles the experiences of David Ginsburg, a marine biologist who spent five months at McMurdo Station in Antarctica studying underwater wildlife. Jewish Folklore with a twist! Bat-Chen wrote about teachers and friends, the angst of young love, and her yearning for peace in the world. Zvuvi's Israel The story of Joseph told in graphic format with whimsical rabbits! 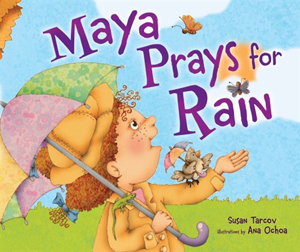 Maya becomes alarmed when she learns that there is a prayer for rain on Shemini Atzeret. A wonderful hands-on learning tool for school or home! Over 300 tourist site in major cities and "off the beaten track" with a focus on the needs and interests of families. Sections on planning your trip, apartment rentals, traveling with babies, summer camps, Bar/Bat Mitzvah celebrations for teens. With maps, photos, index, and bibliography. Sukkot Treasure Hunt: find the parts for lulav and etrog! Sadie organizes a fun breakfast for "friends" in the Sukkah! There are lots of cats on Ben Yehuda Street, but it is friendship between little grey cat with pink collar and fluffy white stray cat that brings two lonely neighbors together. A lesson for all, a lesson indeed. Listen to the Lorax, he speaks for the trees! In a place where the Brown Bar-ba-loots frisk about and the Humming-Fish splash around, you will find the Lorax. The Lorax speaks for the trees, which the Onceler is chopping down as fast as he pleases. Will the Onceler change his destructive ways and heed the wise warnings of the Lorax? With the help of a young boy and the very last Truffula Tree seed the Onceler may still be able to right his wrongdoings. Share in this newly remastered version from 1972 of the Dr. Seuss tale that teaches us all to appreciate and respect the world we live in!